UPDATE: To see the video of this talk click here. How much of your DNA comes from ancient humans? Where do you think humans originated and how did we spread across the globe? The Department of Biochemistry at the University of Wisconsin–Madison invites you to a campus-only talk on Thursday, Dec. 8 and a public talk Friday, Dec. 9 by esteemed researcher Svante Pääbo to explore his answers to these questions. 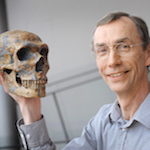 Pääbo, of the Max Planck Institute for Evolutionary Anthropology in Germany, is known as one of the founders of paleogenetics, which is the study of ancient DNA and genetics to understand the past. He specializes in retrieving genetic material from ancient humans, like Neanderthals, who became extinct about 40,000 years ago. The Thursday, Dec. 8 campus-only talk titled “An Ancient DNA View of Human Origins” will be from 3:30-4:30 p.m. in Room 1125 of the Hector F. DeLuca Biochemistry Building at 420 Henry Mall. The public talk on Friday, Dec. 9 will be from 4-5 p.m. in the Headquarters Auditorium at the Wisconsin Historical Society. That talk is titled "Of Neandertals, Denisovans, and Modern Humans." Both talks are free but require an easy RSVP. To RSVP for the campus-only talk click here, and to register for the public talk click here. Each talk will be followed by a short reception with hors d'oeuvres. Live audio streaming of the public talk is available here for those unable to attend. Please note that the link supports a maximum of 100 listeners. Through his work, Pääbo has drafted the genome sequence of Neanderthals and discovered a new group of ancient humans by analyzing DNA found in the Altai Mountains in Asia. By examining these two genomes and the genomes of today’s humans, he discovered people living outside of Africa today share 2% of their genomes with Neanderthals. He has also developed a theory for how modern humans emerged from Africa less than 100,000 years ago and genetically mixed with Neanderthals and other archaic human populations. His findings also tell the tale of how some genes that humans have obtained from Neanderthals are advantageous, while others influence susceptibility to diseases still today. Pääbo’s talks are part of the Biochemistry Colloquium’s International Steenbock Lectureship, funded by the Harry Steenbock Lectureship in Biochemistry and Life Sciences. Harry Steenbock was a highly regarded biochemistry professor who discovered the irradiation process for producing vitamin D.